1. 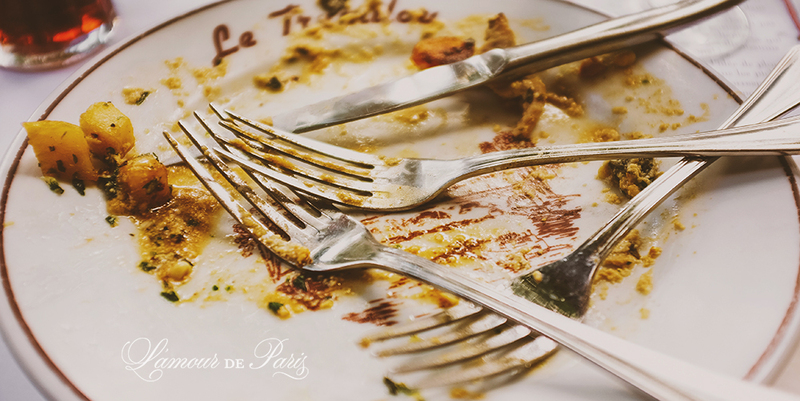 Dining out in Paris is something to be done at a leisurely pace, when you have time to sit back and relax and savor each course. It’s not uncommon for Parisians to sit at one table for several hours and order nothing more than a carafe of wine. In America this would be considered rude, and one might even be asked to order something else or leave, but in Paris it’s simply business as usual. Once a Parisian diner is given a table, it is considered theirs for as long as they want it (there is a rare exception to this, and that is when a restaurant is fully booked out for the night but has some availability earlier in the evening, in which case they will tell you in advance that you must be finished by a certain hour). As a result, don’t expect your waiter to be in a rush to serve you. Generally they are quick to take your initial order, but after that they give you privacy and space and assume that you will flag them down when you need service. In France this is good manners, as they consider a waiter who is constantly checking up on you to be obnoxious and intrusive. If you would like to order something, simply raise your hand subtly at your waiter the next time you see him pass by, or offer a quiet excusez-moi, monsieur (pronounced: ex-koo-zay-mwah meh-syur). DO NOT shout “garçon” as that is the word for little boy in French and it may be taken as an insult. 2. With most outdoor cafes it is customary to simply grab whatever table is available without waiting to be seated. Tables that are set with paper tablecloths and silverware are for those intending to eat, whereas blank tables are for those who only wish something to drink. There are some exceptions to this, particularly if the restaurant is extremely busy, but for the most part if you see several open tables you can grab whichever one pleases you and a waiter will come along shortly. If the thought of bursting in and grabbing a table on your own frightens you, or when dining inside, simply wait at the entrance and someone will come along and help you. A good phrase to remember is deux pour manger (pronounced: duh por mahn-jay), which means that there are two people in your party and you wish to eat. If you only want a drink, the phrase would be deux pour boire (pronounced: duh por bwahr). 3. The French eat lunch (déjeuner, prounced: day-zhun-ay) from 12-2, but they customarily eat dinner (dîner, pronounced: dee-nay) much later in the evening, between 8-12. If you wish to dine like a Frenchman but you don’t think you can hold out eight hours without sustenance, there’s always le goûter (pronounced: luh goo-tay), which is French snacktime. From 4-7 every afternoon, French cafes and brasseries suddenly become crowded with Parisiens enjoying a glass of wine, cup of hot tea or coffee, or even just a glass of fresh-pressed juice. Most establishments offer a small snack along with a drink order such as nuts, olives, or chips. If your stomach is growling especially loudly you can order an assortment of cheeses or charcuterie. Personally I like to take advantage of the cultural difference and have an early dinner at 6 or 7, which allows me to get into very popular restaurants without advance reservations and still take advantage of happy hour specials. 4. If you would like free tap water, ask for un carafe d’eau (pronounced: uh cah-raff doh). Tap water is perfectly safe to drink and tastes just fine. If you prefer the pricier bottled version (and I do mean pricey – often 7-10 Euro per serving), request eau minérale naturelle (pronounced: oh men-eh-ral nah-tyoo-rell) for still water or eau minérale gazeuse (pronounced: oh men-eh-ral gah-zuz) for sparkling water. Bread is complimentary in all restaurants, but if your waiter fails to bring you some you can always ask for du pain, s’il vous plaît (pronounced: doo pan, see voo play). 5. The bill will not be brought to you unless requested by saying l’addition, s’il vous plaît (pronounced: lah-dee-cee-own, see voo play). It’s very important to remember that in Paris, gratuity is already added onto your bill, so you only need to pay the amount stated. Restaurant receipts are required by law to list all kinds of various taxes and fees included in your bill, and to complicate matters further these fees are often printed below the total, but generally the largest number is the one you must pay. I often add on a extra Euro or two for especially good service (old habits die hard!) but it’s certainly not necessary. Also, when leaving it is polite to say goodbye to the waitstaff, particularly your waiter – a simple merci, au revoir (pronounced: mur-cee, oh-vwah) will do. 6. It’s not uncommon to be placed at a long rectangular table with other diners. The French don’t believe in leaving seats open unnecessarily, so if you go into a restaurant as a twosome, you may be paired up with another couple at a four top. 7. Here is a humourous guide for decoding a French menu and another list of useful terms and phrases. I recommend copy and pasting these lists to your cell phone so if you need some guidance while you’re eating out, you can simply pull it up and use it as a reference. Many restaurants do have English menus available, or at least one English-speaking waiter on staff who can help translate for you, so don’t be afraid to ask for help if you need it. The best advice I can give you is to plan your dining out in advance. French dining is world famous for good reason, but if you allow yourself to get starving without a game plan, you’ll usually end up somewhere touristy, overpriced, and unsatisfying. It’s well worth the prep time to research the neighborhoods you’ll be in on each day of your trip so that you know exactly what direction to head in when your feet is tired and your stomach is growling. If you dine early (6-8) then you should be able to get into most places without a reservation. If you like to dine late, it’s especially important to plan your dinners in advance and make reservations. Here are some of my favorite restaurants in Paris – if you have a fantastic experience somewhere, let me know! This gastronomic eatery, located steps away from Le Bon Marche, is a foodie’s paradise. The small menu changes often and features creative twists such as blood sausage in a chestnut cream sauce, pureed scallops over butternut squash, duck confit egg rolls in a crunchy pastry cone, warm lentil parmesan salad with bacon and poached eggs, and homemade shortbread topped with fresh grapefruit and creme-fraiche. Personally, I have a more traditional palate, and I don’t often enjoy restaurants with “out-there” menus, but L’Epi Dupin is still my favorite eatery in Paris. It forces me to go out of my culinary comfort zone, but I don’t have to be nervous about it because I have yet to have a bad experience with any course. The price is a flat 38 Euro for appetizer, main course, and dessert (as well as a complimentary amuse-bouche), which is a steal for the quality of food you receive. Make reservations a few days in advance. One of the many restaurants from famed chef Christian Constant, this small but chic diner-style restaurant offers dishes that are light, simple, and delicious. I could easily eat the creamy parsnip soup and crunchy croutons by the gallon, and the light and fluffy waffle with chocolate sauce is not to be missed. You can’t go wrong with any main course, but I particularly enjoyed the roasted pigeon with creamy mashed potatoes and the scary-sounding but unintimidating and incredibly delicious pig’s trotter (think roasted potatoes stuffed with ground pork). The wine list is exceptional and reasonably priced, and they also have several great options for brunch or midday snacks. Les Cocottes does not accept reservations, so you’ll need to arrive early or prepare to wait, especially if you have a larger group (my group of 4 arrived at 6:45 for the 7 PM service on a Saturday night and just barely got a table). Expect to spend around 30-40 Euro for three courses without wine. Walking into Robert et Louise feels like being welcomed into a French country home. Red gingham curtains, fresh flowers atop rustic wood tables, and the smell and sound of a warm crackling fire are the perfect complement to the hearty food. The menu is composed of several meat options, which are cooked to your preferences over the fire along with your choice of potatoes, salad, or the vegetable of the day. The menu is simple but deliciously seasoned and perfectly cooked. Robert et Louise is the perfect place to warm up on a cold, rainy Paris day. Reservations are not needed if you come early, but it fills up quickly. The formule (plat du jour plus appetizer or dessert) is a steal at 12 Euro, but normally you can expect to spend around 30 Euro per person for two courses and a drink. This boulangerie repeatedly wins the title of “Best Bakery in Paris” and that designation is well-deserved. I was as skeptical as anyone, but one bite into a fresh, warm, slightly sweet croissant from their shelves and I was an instant believer. The lines here are often long, but they move fast and are worth the wait. Though their croissants are the can’t-miss star of the show, you can’t go wrong with any choice here. Save some money by skipping lunch one day and picking up a few items here instead. Located just off the Champs du Mars in the shadow of the Eiffel Tower, Au Petit Sud Oest is THE place for all things duck. From foie gras to confit de canard, if you like duck, you’ll adore Au Petit Sud Oest. The service is the best in Paris – warm, friendly, helpful, and entertaining, outshined only by the food. I recommend the cassoulet (a warm white bean stew with sausage and tender chunks of duck meat served in the copper pot it was cooked in) as well as the Civet de Canard (roast duck in a delicious sauce, served with the greatest potatoes you will ever ever eat). The bloc of “mi-cuit” duck foie gras, served with fresh bread and your own personal tabletop toaster, is a great introduction to foie gras if you’re not familiar with it. The fondant au chocolat is a memorable way to finish, particularly if you ask to add on a scoop of vanilla ice cream. 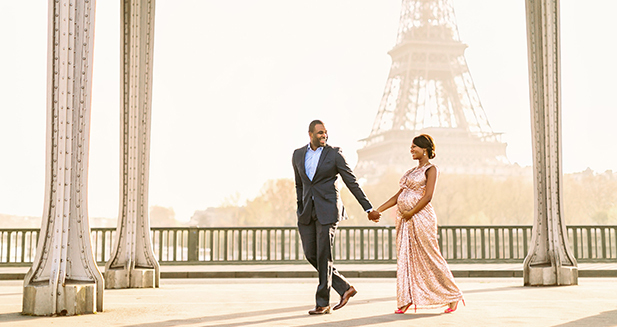 This is a great spot for a romantic evening, as you can stroll over to the Eiffel Tower and enjoy the light show within minutes of your meal. Reservations recommended, though they can often be made last-minute. If you’re feeling weighed down by heavy French meals and you need something fresh and light, Breizh Cafe will hit the spot. Breizh’s specialty is crepes and galettes (crepes made of buckwheat flour) made of fresh, organic ingredients. They also have a menu of 50 different ciders, accompanied by flavor descriptions to make it easy to choose the one that fits your tastes. I was pleasantly surprised by the appetizer of walnuts, honey, and blue cheese mini-crepes (a generous portion, enough to share). Whatever you do, don’t miss the Dame Tatin for dessert – a warm, soft, buttery crepe filled with sweet apple compote. Briezh is super popular, so make reservations well in advance. Di Vino is neither cheap nor fast, but it is that rare, wonderful mix between a great meal and an unbeatable view. Located on the Place de Mexico, about two blocks from Trocadero, this tiny little Italian restaurant is the perfect place for a sunset dinner al fresco. It’s surrounded on all sides by beautiful classic French Hausmann architecture, it’s in a quiet but lively residential neighborhood that feels like something out of a movie, and if you’re lucky enough to grab one of the six or seven tables on the side terrace, it has a direct view of the Eiffel Tower. The pizettas are light and fresh, great for an appetizer or a midday snack (and large enough to share). The veal parmesan left my husband raving for days, and the risotto con pollo was a treasure that I have been searching all over Paris for, especially when mixed with the incredibly flavorful chicken jus surrounding the creamy parmesan risotto. Pricetag was 150 Euro for one appetizer, two main courses, four glasses of wine, and one dessert. A bit high for our tastes, but well worth the atmosphere and the meal. Reservations not needed if you come early, but call in advance for a table with a view. Chef Alain Passard is widely considered to be one of the greatest chefs in the history of gourmet cuisine, and this three Michelin starred restaurant will definitely show you why. Passard, who was famous for his treatment of meats (particularly red meats), shocked the cooking world when he took meat off the menu in 2001 to focus on his technique cooking vegetables. These days you can once again find seafood and white meats on the menu, but only in sparing amounts. However there is no chance you will leave this restaurant feeling unsatisfied, even meat lovers like me. The prices are what you might expect from a restaurant of this caliber – 60-100€ per course – but the lunch tasting menu is an incredible steal at only 130€ for ten courses (with your choice of seafood, meat, or full vegetarian). I recommend opting for the tasting menu with the lobster, which is easily one of the best dishes I have ever eaten in my life, and I don’t normally like seafood at all! I often get asked for vegetarian restaurant options, and this is THE place for veggie lovers. It won’t be a cheap meal, but it will be a meal you will remember and rave about for years to come. Although the Frenchie restaurant across the street is certainly more lauded (with a three-month wait list to prove it), virtually everyone I know prefers the wine bar for its amazing wine list and diverse menu. The food is served tapas-style, with each plate containing small bite-sized portions intended to be shared. I didn’t believe it when a friend told me that the butternut squash and brown sugar ravioli was the greatest thing she had ever had in her life, but I can now attest that it is in fact amazing and one of my favorite dishes in Paris. The pulled pork sandwiches are tasty, and the tagliatelle with beef ragu is especially good when sopped up with fresh bread. The employees at the wine bar are experts at selecting bottles based on your preferences, and although it’s not on the menu, they will serve you wine by the glass if you’re not in the market for a full bottle. However, prices are high-ish and the service, while friendly, can be stretched to the limit when the wine bar fills up (which is virtually always). Expect to spend 15 Euro per plate with 2-3 per person for a meal, and around 30-40 Euro for a bottle of wine. No reservations, come early if you want a table or be prepared to stand at the bar. In general, I don’t recommend eating near any major tourist attraction or on any major street, as the food is usually pricey and mediocre, but the Imperial is a glowing exception. Located on Rue Rivoli across the street from the Tuileries, the food here is anything but mediocre. I’ve ordered everything on the menu from quiche lorraine to beef bourgignon to croque madame to a good old-fashioned cheeseburger, and I’ve never been disappointed. I especially love the hot crispy french fries, served in generous portions. The cafe creme (better known as cafe au lait in the US) is my favorite in Paris, and you can even order a double portion served in a massive mug with a side pot of frothy warm milk (the chocolate chaud is a treat, as well, and in my opinion better than neighboring Angelina’s). The interior is high-end and lush, and if you can I recommend getting a table along the window tucked into the thick black velvet curtains for a rare bit of privacy. The downside is that the service here is unfortunately exploitative of tourists, and though the waiters are nice and friendly, they often pressure guests into leaving quickly (usually by bringing the bill early and asking regularly if you’re ready to pay yet) or by pressuring you to leave an extra tip. If you can ignore these things, and if you’re prepared to pay a little extra for the convenience of eating so close to the main tourist strip, it’s a nice place to grab a delicious lunch on a long day of sightseeing. Reservations not necessary. Bistrot des Comperes is one of my favorites because of the incredible value for the quality. At only 20 Euro for two courses or 28 Euro for three courses (even better deals for lunchtime) and a very reasonable wine list, you can have a long and delicious French meal here without destroying your wallet. The service is wonderful, the atmosphere is quaint and intimate, and the food is flavorful and fresh. Especially notable here are the appetizers, including the chilled goat cheese creme brulee with sweet onions, the organic ricotta and spinach ravioli in a tarragon spiced sauce, and the creamy truffle risotto. I went here with a group of four people and after four starters, four main courses, two desserts, a full bottle of red wine, a kir royal, a carafe of white wine, two cappuccinos, and one cafe viennois, the total bill was only 110 Euro, and everyone had enjoyed their meals. The restaurant is a little isolated and hard to find, but if you want the full French dining experience without the French dining price, this little haunt in the Marais is well worth the trek. The bad thing about Les Papilles is that you don’t get to pick what you eat. The good thing about Les Papilles is just about everything else. This small little restaurant tucked just outside of the Jardin du Luxembourg is the labor of love for its staff, who are dedicated to providing an amazing dining experience. The menu changes every day, offering one entree (usually a vegetable soup of some kind), a main course, a cheese course, and a dessert. On my last visit, we had a thick carrot soup with chunks of hearty bacon to start, followed by a family-style pot of chicken, mushrooms, and haricot verts in a creamy pesto sauce, a small medallion of chevre rolled in fresh herbs and pepper, and a light panna cotta with chunks of juicy pineapple. Each course was amazing and universally pleasing to the entire table. I understand the fear of going to a restaurant with no choices, but take a look at some of the items mentioned on the TripAdvisor reviews and you’ll see that every day’s menu sounds equally delicious. Worst case scenario, if you have a member in your group that has allergies or food preferences that conflict with the night’s menu, the chef will whip up something special for them. At 24 Euro a person for lunch or 33 Euro a person for dinner, this is a steal, and well worth making reservations for (reservations taken by email in English, just be sure to confirm your reservation the morning of or they will give it away). My current favorite neighborhood restaurant, La Petite Tour is most noticeable for its freshness and quality of ingredients. It is classic French cooking – simple recipes, well-seasoned and perfectly cooked proteins, fresh and delicious vegetable sides, and complex sauces to tie it all together. Every time I go I try something different, and I have yet to have a bad experience. The roasted artichoke and mini-ravioli appetizers are both wonderful, and I particularly love the grilled sea bass as a main course. The fish has a perfect smoky flavor and comes with a pot of creamed leeks that are insanely good. They also have several cuts and grades of beef to choose from – go with the top of the line Argentinian Angus beef. Good beef is very hard to find in France, but this filet was melt in your mouth good. For dessert, try the strawberries and raspberries with fresh cream. It sounds simple, but it’s one of the best desserts I’ve had in Paris. The chef manages to find the most flavorful fruits I’ve ever experienced – I didn’t even know fruit could taste like that! – and the homemade chantilly adds just the right amount of creaminess.